Swept up in the frenzy this month? Making lists and menus and plans? Shopping and shlepping and wrapping – Oh, my! In the present moment dwell peace, harmony, joy… all we desire. Some beings know and instinctively live this. Look at animals and little children. Is your dog still agonizing over last week, when you came home a half hour late? Does the baby worry about a college education – or about how quickly potty training is progressing? Ha! Of course, we need to review the past in order to learn, to truly turn our wounds into wisdom (as I help people do with deep omnidimensional healing). Yet so many people live their entire lives without ever really living. “What if?”ing and “If only”ing through their whole lives, living in the past or future — and usually through a negative lens. One psychological study actually found that 75% of people’s thoughts are a) negative and b) redundant, like a loop. Time to get off the cranky, creaky hamster wheel! No time like the present. Literally. When the phone rings, I stop and breathe . 2. Find the beauty in this moment. Look, listen, touch, sense the beauty and love within you and around you. What is beautiful, what is loving, what is healing, what is joyful in this moment? Be present with it. Say hello. Say “Thank you” in your heart. I love to do this one in traffic or when waiting in a line. Instead of indulging in useless mind chatter or frustration, I may notice a bird flying outside, the beauty of a leaf waving in the wind, or the rain on the windshield, smile at the bank teller, send love to the Earth… Or I give myself a hug. I like to call it ME TIME, BE TIME. This may sound crazy in our culture, but we need regular time to just BE. No agenda. No list (internal or external!). No activity at all. This is different from recreation, socializing, exercise, massage, or any other activity, even those that are healing. I’m talking about being in the spaces between. Dwelling in silence and stillness. Rediscovering your own blissed, blessed being. Taking a weekly Sabbath is one lovely way to do this as is daily meditation. Even just sitting and doing nothing counts and is actually quite productive because you will be far more effective, focused, pleasant and creative when you do come back to do/engage mode. Buddhist monk and spiritual teacher Thich Nhat Hanh shares this meditation breath in his book Being Peace. Try different mantras like this. These really work. Imagine that any given moment in your life is either the very first or the very last time you will be able to experience that. There is a Zen parable about a man falling off a cliff and as he tumbles to his certain death, falling down the mountain and banging off the rocks, he sees one single strawberry growing along the mountainside. He plucks that berry and gets it in his mouth. It is the most delicious food he ever eats because he knows it is his last bite on Earth. We don’t have to wait until our last bites or our last breaths to be THAT present. It changes everything. I encourage you to not just read this article but to live it! An ancient yogic practice simply involves gazing at a candle. This practice calms the mind, and brings you into the present. If you gaze at the lowest blue-indigo part of the flame, you will also open your Third Eye. As an open-eyed meditation, you can also gaze at water, stars, clouds, moon, a mandala, crystal or flower. Imagine you are a big, ancient tree. Send your roots down into the ground. Bring up all the nutrients you need from the Earth, drinking them deeply into your being. Release down what you no longer need, trusting that Mother Earth receives it as a fertilizing gift, and transforms that energy into something fresh and beautiful. Stretch your branches up to the sky. Feel the wind caress your leaves. Trees teach us stillness, patience, presence, and connection to the Earth plane. Hug a tree and listen. You can even go outside (what a concept, right?) and HUG A TREE. Commune with the tree people. Here is a photo of me doing just that. (And caresser) FEEL the instant Earth energy. Sit cross-legged on a cushion. Center yourself. Now feel yourself as a giant mountain, timeless, wise, tall and strong. Picture a mountain in your mind and become one with the mountain. Ask the mountain, what medicine or message do you have for me? 9. Breathe Fully & Consciously. Sitting as in #8, place your hands gently on your abdomen. Gently relax your head so your neck is loose. Let go of any tension, and breathe deeply, slowly, fully, into your belly. Feel your abdomen expand. When you are full, be with the fullness for a moment. Now exhale, gracefully, until you are empty. Be in the emptiness. Notice what joy fills you in this emptiness! Adapted from The Art of Breathing by Frederick Leboyer. Follow your breath, simply observing it. 10. “Stop and Breathe” signs. You will be amazed how long one conscious breath can be, and how refreshing. My children are wonderful teachers as they remind (or should I say “demind”?) me of this consciousness-shifter when we are driving around together. I love it! When we choose consciously to create the space for ourselves to be present, many wonderful blessings unfold. We reconnect with our own center and joy. We feel healthier. We treasure every moment. Recognize that you deserve peace, joy and health. Period. Also, anything that heals you is inherently productive, to that beautiful little piece~peace of the Universe/God that is you, and also to all the world, for we are all interconnected. In fact, as we replenish our own inner springs, we have more to give others, and we can give from a full place. Seriously. Make sure you have extended time over the holidays when you are not on the computer, your phone is turned off, and you are not even watching movies or TV. You are literally HERE in this world, relating to people you care about, doing other activities you enjoy. Maybe it’s a great time for you to work on that writing or art or music project. Or get out in Nature more. Or reach out to someone you haven’t spoken to for a while. Make a craft, have fun cooking and baking, sing some carols, visit neighbors. Cultivating being present also enables us to be better listeners, parents, siblings, friends, and lovers. Perhaps you could invite some of your loved ones to stop and practice some of these techniques for being present together this holiday season. Allow life’s cup of blessings to fill you. Slow down and drink it in. Happy Holidays and may your every day feel wholly holy! Which will you commit to doing and sharing with others? How can you stay present and balanced this month? Please share your thoughts in a comment below. Thanks! 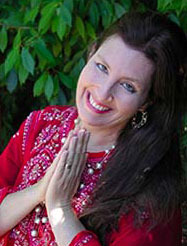 SAGE, The Prosperous GoddessTM is an Archangel Michael, Metatron, Divine Mother & Yeshua channel, intuitive abundance and soulwork business coach, shamanic healer, hypnotherapist, Reiki Master and teacher, Money Reiki Grand Master, Intuitive Angelic Miracle Healer and trainer, #1 best-selling author and interfaith minister. Known as a catalyst for personal and planetary transformation, with a joy-filled teaching style, Sage dedicates her life to helping Lightworkers and heart-centered women love Self, Spirit & Life, awaken into the truth of who you truly are, connect with the Divine, prosper, thrive and shine! Enjoy this article? Be sure to >>> subscribe to the blog so you don’t miss the new posts! Want some free gifts & resources for self-love, happiness and spiritual awakening? (a value of $197) for FREE. The Radiant Radical Self-Love Immersion features 5 beautiful self-love meditation audios and an inspirational experiential workbook / playbook. I just read your email regarding your blog and I loved your play on words with holidaze and your reminder to be present. I have been doing just that this holiday season and I think it is because I am forgoing shopping this year. My sister and I are heading back East in a week for Christmas and rather than shop until I drop I am gifting experiences with the family such as taking everyone out for a nice meal, movies, starbucks. It is family time and fun, and that is what matters most. I suggested that I do this with others that I usually exchange gifts with and they were all for it. So, I find that I am much more relaxed about the Christmas season. After work, I head home, listen to holiday music while I try out some new recipes to warm me up in this cold weather. I am watching holiday movies, reflecting on the meaning of Christmas and attending concerts ,the holiday home tour and even the Governor’s tree lighting event. Simple things that are fun and that have me really enthused about Christmas. I haven’t enjoyed the holiday this much in years. I hope you and your loved ones have a very Merry Christmas and a Happy New Year. The Christmas season has always been my favorite time of year. It can be one of the most stressful. A few things that work at any time of year are follow your joy. What fills your spring? At Christmas, I love the magic. It is something I have never given up since childhood. There is so much joy in decorating the tree, listening to music, taking a walk at night to see the lights on people’s homes and snow activities with the kids if you have it nearby. There is something special about the smells of Fall and Winter. The leaves as they dry and break down. The ionized air after a storm. The beauty of freshly fallen snow. The season and the holiday are actually meant to be reflection times. If possible, do whatever shopping you want to do during the year. Not during the holiday rush after “Black Friday”, whatever that is. Try to simplify. Take the time to enjoy the things I mentioned above. Sponteneity is wonderful anytime, but it makes this magical season even more memorable for all involved. This year, we missed the local tree lighting by a half an hour because of a misprint in advertising. I told the kids we should go anyway. Even though the choir performance was over and hot chocolate was gone, we had a great game of tag in the field near the tree with other attendee, drove around looking at lights and got ourselves on a hayride with caroling neighbors as the fog blew through! We had our hot chocolate at home and made memories! Great reminder to practice and know that the quality of our lives is our choice. Great reminders to slow down and breathe! I really like all of these and especially the more simple ones like the stop sign breath and the “present moment, wonderful moment” breathing meditation. I am going to also try the one with the candle and the blue part of the flame. My family all chose years ago to stop the gift exchange frenzy and we are a lot happier for it. I Like Catherine’s idea of sharing time together instead. I am going to make the effort to schedule some sharing time with friends this year. i like the stop sign and breath…..thx…saga….many happy holidaze…. Reblogged this on Love & Spirit Weblog. Love the ‘I am here… I am now’ and the gazing meditation. Also, going to do the candle thing. Love candle gazing and have been doing it for years but love the idea and will share that gazing into the blue part of the flame opens the third eye. Lovely thought!!!! Sage I felt a lot of positivity as I read your blog. I was drinking it in. My daughter ill for 3yrs I will never stop trying to send these positive vibes.her way. On my way to work each day I visualize a pure reflective light and say the following for me, then members of my family, then for everyone in the workplace and finally I say it for as far as it will go…..here goes….”I see a pure reflective light…ridding thee of bad luck and negative energy O Blessed Be!” I am one person and I think some of this positive energy is definitely reaching some people! Merry Christmas and Happy New Year Sage! 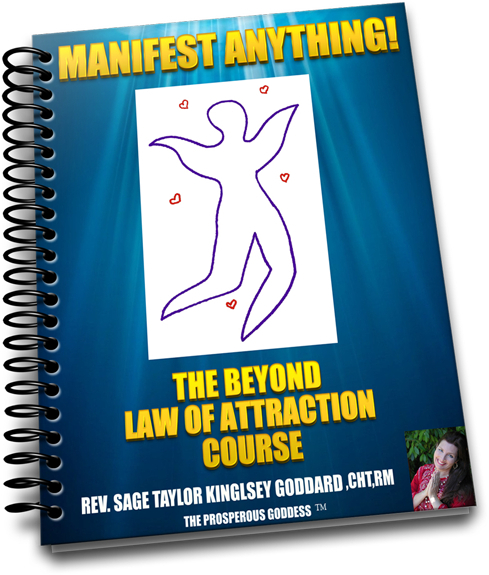 FREE ANGELIC LAW OF ATTRACTION COURSE! Passion & Purpose, Love & Labor: The 3 Sacred Keys to Live YOUR Passionate Purpose! Rev. Sage Taylor Kingsley-Goddard, CHT, RM, a.k.a. The Prosperous Goddess™, is a 6-figure Abundance Acceleration & Business Coach, award-winning Law of Attraction expert, and gifted Archangel Michael Channel & Emissary. Sage passionately empowers you to connect with your angels, PROSPER, THRIVE & SHINE!